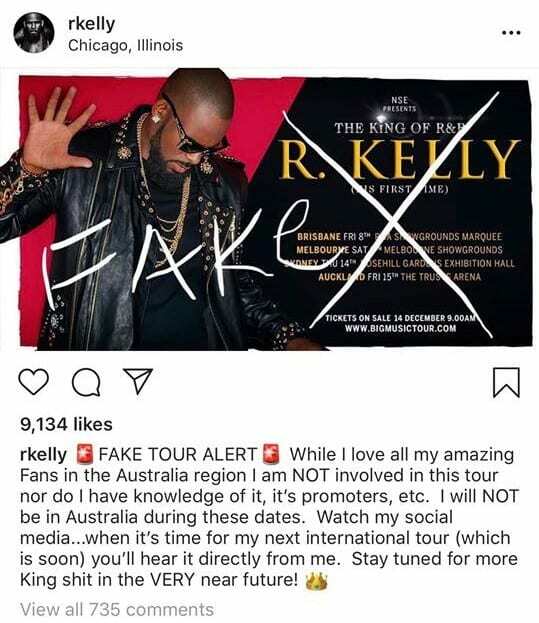 Over the weekend, a concert promoter announced an all-ages 2019 Australia and New Zealand tour for R&B artist R. Kelly, yet the singer claimed this tour is fake and he will not be touring down under. The promoter, Big Music Tour, revealed R. Kelly’s “King of R&B Tour,” which was supposed to make stops in Brisbane, Melbourne, Sydney, and Auckland. Since the controversial singer has been accused of sexual assault on several occasions, the tour announcement upset many people. “Our company has been dealing with his manager and are aware, that after our announcement yesterday, offers from other Australian promoters, offering higher fees than we have in our executed artist agreement, started to be presented to Mr Kelly through other sources,” Big Music Tour said. “We did not anticipate it would cause any issues, but unfortunately it has. R. Kelly is under fire after multiple sexual assault allegations have come to the forefront. Over the past 24 years, he has been accused of sexual abuse, which has been outlined by Vox in a timeline. A #MuteRKelly movement has been working to get all of his shows cancelled. This past April, the movement shut down his show at the University of Illinois-Chicago. His New York City show in September was cancelled due to Hurricane Florence, but Spin reported that ticket sales were extremely low ahead of the gig. The cancellation also came a day after Kelly’s younger brother accused him of sexually abusing their 14-year-old cousin, according to Vibe. Following the new allegations, his ex-wife, Andrea Kelly, shared her traumatic experience with him on The View in October.